Economic sanctions provide financial and diplomatic pressure to further U.S. foreign policy goals and national security interests. By targeting individual actors, economic sectors, or an entire foreign government, sanctions are an attractive alternative to softer diplomatic options and drastic military action for the U.S. government to act upon its positions before the international community. Because sanctions are a malleable tool that can be tailored to specific situations, their use has risen to address a wide range of issues, such as the proliferation of weapons of mass destruction, regional destabilization, terrorism, the narcotics trade, corruption, and human rights violations. Sanctions against human rights abusers have historically been more challenging to implement due to the difficulty in obtaining sufficient information to legally support such cases, and a perception by some in the U.S. government that sanction designations of those involved in atrocities are ineffective. As a result, the number of persons sanctioned for human rights abuses is markedly lower compared to those designated for their role in terrorism, nuclear proliferation, or the narcotics trade. In addition, resources are prioritized for sanctions programs responding to what are seen as presenting more of a clear and present danger to the United States, such as Iran and North Korea, than for those considered ideological in nature and less threatening to U.S. national security. At the same time, human rights advocates are often reluctant to call for sanctions in part due to their potential unintended consequences, particularly those created by comprehensive embargoes, which prohibit U.S. persons from almost all transactions with a targeted country’s persons and entities. The complex nature of many sanctions regimes also creates a barrier for non-practitioners of sanctions law to engage. Coupled with the U.S. government’s lethargy in implementing and enforcing human rights-related sanctions, this reality has resulted in an underutilization of sanctions as a tool in human rights strategies. 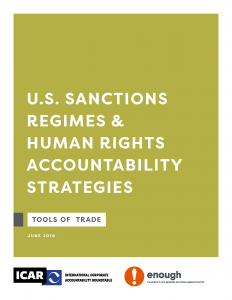 This paper seeks to bridge these gaps by providing a resource for human rights advocates and practitioners, both within and outside the U.S. government, to understand the fundamental principles of U.S. sanctions and evaluate opportunities to engage in sanction-specific advocacy strategies. The paper explains the legal framework of U.S. sanctions and the roles different agencies play in administering sanctions programs. It then discusses specific sanctions programs or mechanisms that can be leveraged to promote human rights abroad. These include: (1) imposing targeted designations through existing country programs, (2) targeting international human rights violators using Executive Order 13818, “Blocking the Property of Persons Involved in Serious Human Rights Abuse or Corruption,” (3) leveraging sectoral and secondary sanctions for human rights objectives, and (4) using sanctions authorities to increase transparency requirements for businesses engaged in areas with specific human rights risks. Ultimately, this paper aims to assist practitioners and advocates to utilize sanctions more effectively to promote human rights objectives.